The cruise line seperates the different categories (Inside, Oceanview, Balcony) into subcategories. The only difference in the subcategories is usually location on the ship. The detail above shows subcategory color, category name, and subcategory name. For detailed information, mouse over a cabin on the deck plans and a pop up window will appear. You will find diagrams, pictures and information about that cabin category including square footage and features. Click links below to view cabin categories details. Here are some tips that you should keep in mind when looking for cabins on this deck. There may be other issues that we haven't noted, and if you are aware of any issues we have not listed, please contact us and let us know so that we can add it to the list. * Some cabins have a part or full solid metal railing. This includes cabins 13005, 13007, 13009, 13011 and 13267 on the port side and 13004, 13006, 13008, 13010, and 13256 on the starboard side. Click here to become a member of one of the best cruise websites in the world. - Category B1 cabins facing forward on decks 9, 10 and 11 have extra space with single bed. These cabins interconnect with a inside cabin and another B1 forward facing cabin to make a SUPER FAMILY PLUS cabin. - Some aft facing B2 cabins on decks 9 to 14 also have extra single bed space and can be combined to form a SUPER FAMILY PLUS cabins. - Combine just the balcony with the adjoining inside and that will be called a FAMILY cabin. 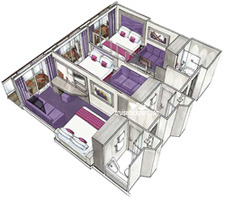 Expanded balcony cabins have 97 square foot balconies. In some cabins the bed will be close to the balcony door. In other cabins the couch will be close to the balcony door. Deck 9 category B3 cabins on port and starboard side will have balcony partitions that do not extend all the way to the railing. This means that the area around the railing will have clear dividers (railing height) between balconies. You will be able to see your neighbors balcony. 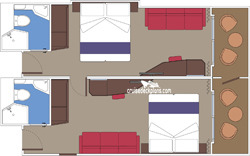 *Cabin size and layout may differ from size, diagrams and pictures shown. 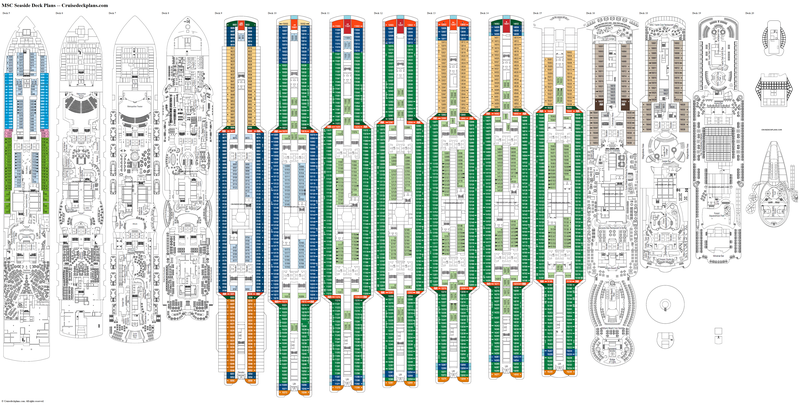 Diagram represents deck 9 S3 suites. 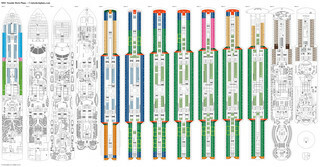 Diagram shown above represents S3 suites on deck 9 (except for aft facing suites) and those balconies are extra long and the balcony itself is about 172 square feet. Cabins with angled balconies are approx 215 square feet plus 80 square foot balcony. Deck 9 category S3 cabins on port and starboard side will have balcony partitions that do not extend all the way to the railing. This means that the area around the railing will have dividers (railing height) between balconies. You will be able to see your neighbors balcony. Staterooms 9002 and 9003 balcony is 409 square feet. 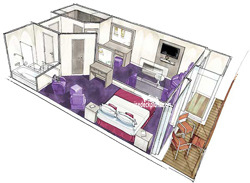 - The center GS suites have more square footage in both cabin and balcony, but vary in size. 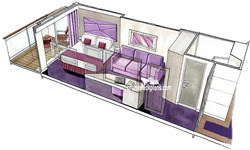 - Corner Grand Suites have small side balcony and porthole window overlooking bow of ship. Forward Grand Suites located in the middle are longer with a second bath with toilet and shower and a second bedroom with two twins that can be joined as double. There will also be a glass enclosed porch on the deck to protect against wind while ship is moving forward. These suites vary in size but average reported size is 398 square feet with 200 square foot balcony area. Cabins 11001 and 14001 are the smallest. Cabins 10001 sleeps 5 and cabin 13001 sleeps 4. Suites 14002 and 14003 accommodate only 2 guests. Cabin size ranges from 150 to 156 square foot. Square inside cabins are 172 square feet. Forward IW cabins on deck 10 are inside because they are enclosed in the hull of the ship. There is not a balcony as shown on the deck plans. 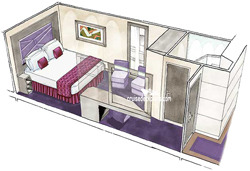 - Double bed which can be converted into two singles (upon request). - Wifi connection (for a fee). - Balcony with whirlpool bath. Cabins facing foward are in hull style balconies.